Pastor's Appreciation Crafts and Activities! This free eChart is just 8 activities out of the 65 activities from “I Learn Respect” Instant Bible Lessons. Each full lesson includes a Bible story, key memory verse, and even more activity options! Get the complete Instant Bible Lesson book for just $8.99. Shop now and save $5. More and more studies show that the care and words spoken to babies during early childhood development really matter. This is great news. It means it’s never too early to start teaching babies about God’s love for them! So, how can you start teaching babies about God? As you hold, rock, change, feed, and play with babies, the lessons in this book will help you teach children how to give thanks to God! It includes everything you need to teach eight complete lessons with over 65 themed-Bible activities you can use! Covering everything from thanking God for their family to thanking God for church, each lesson will teach little ones the importance of gratitude. It includes great lessons for Thanksgiving! Each reproducible lesson includes a short Bible story, step-by-step instructions, and multiple activity options that are all age-appropriate! Enjoy having over 65 activities for your nursery! Get toddlers excited about God with these fully-illustrated, reproducible Bible lessons! You already know that toddlers have short attention spans and can get… wiggly. Imagine having 65 different activities that will keep them actively engaged as they learn about their Heavenly Father and the world around them! Each lesson begins with a short Bible story followed by an engaging visual that teachers can make to enhance learning. Then a variety of themed Bible puzzles, games, crafts and snacks that will help kids remember the lesson! Your kids will smile from ear to ear as they talk about God’s blessings toward them, including food, their families, pets, and more! Perfect for children’s church, mid-week services, Sunday School, homeschool, after-school sessions, and kids ministry! Packed with puzzles, games, crafts, and awesome Bible stories, this reproducible kids’ Bible lessons will keep your preschoolers involved in creative and active learning as they find out about respect! 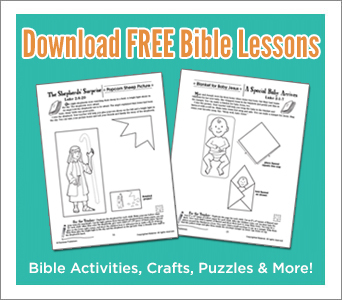 Each reproducible lesson includes a short Bible story, step-by-step instructions, and over 65 exciting Bible activities you can use. The variety of activity options allows you to shape and customize your lesson for your class. Kids will find out the importance of respecting their parents, missionaries, pastors, God’s church, and more! Invite kids to walk with Jesus by teaching them important lessons from his life! From Bethlehem and Nazareth to Samaria and Bethany, kids will find out about Jesus’ birth, Jesus’ miracles, and more! Not only will they learn about the countries and customs of Bible places, they will also learn about the life of our wonderful Lord. Each of the all-inclusive, extended lesson plans comes with a Bible story, memory verse, discussion questions, 8 activity options, and teachers tips! Packed with over 64 flexible activity options, you can easily customize your lesson to your class—whether large or small, active or quiet, kindergarten or upper elementary. Being a preteen isn’t always easy, but these reproducible Bible lessons will show your kids how to trust God. Packed with cool stories, fun games, discussion questions, and awesome Bible activities (crafts, skits, and creative projects this reproducible Bible lessons cover key Bible passages that will equip them for life, including the Lord’s Prayer, the 10 commandments, the Beatitudes, the Armor of God, and more! It includes eight extended lesson plans and 60 activity options, making it easy to shape and customize your lesson for your class. One Week Only! Get this Instant Bible Lesson book packed with over 65 activities for just $8.99! Shop now to save 35%! Don’t Wait! Save $5 For This Week Only! Save 35% on select Instant Bible Lesson Book— Just $8.99 (Reg. $13.99). Order it today and save $5. Offer good while supplies last.